Ok, it's Monday so let's kick this thing off. This will be mostly advisory stuff, I'll make an effort to make sure no one gets butthurt. I'm reasonably sure you'll see some things in here that you've never seen before. I'll start off with a bearing from a Trek BB90. It's not just 'worn', it's 'worn the F out'. This is what happens when you ride in all conditions, ignore maintenance, and pay no attention to whatever strange noises are coming from your bike. 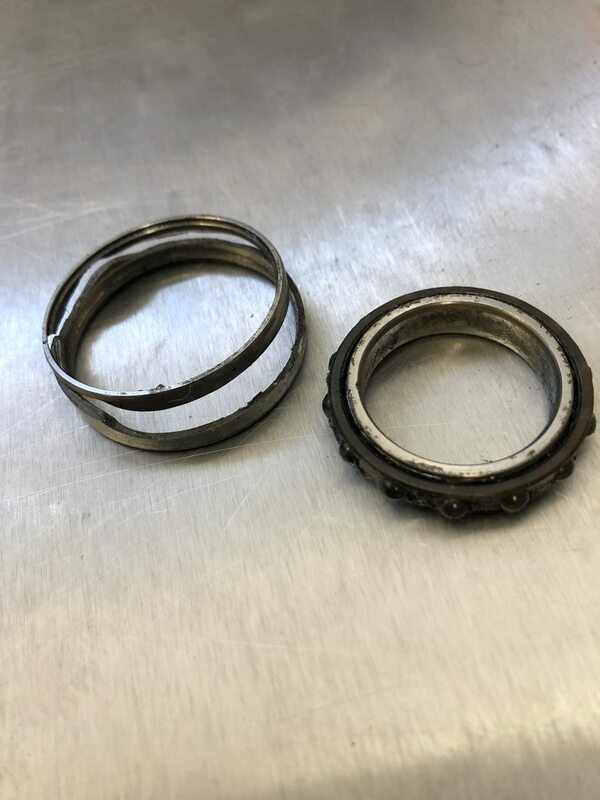 In this particular case it could have been a click from the bearing race wear or a creak from the corrosion on the outside of the bearing itself moving very slightly against the carbon bb shell. In this case it went wayyyy beyond that and the owner thought the crank was loose because there was so much movement. The crank axle was rusted to the inner race of the non-drive side bearing. Normally you can just take the NDS arm off and pull the DS out (Shimano crank). Not this time. I needed to spray PB Blaster on it daily for 3 days then hammer the crank out, at that time the inner race and balls came out leaving the outer race stuck in the frame. Time for more PB Blaster and then a propane torch. I managed to pry it out after a few tries. Takeaway: Pay attention to maintenance and noises that you haven't heard before. Please. Let's give CX a rousing round of applause for bailing out the clueless idiot who saddled him with this repair! Seriously, riders have no idea the challenges mechanics have to overcome to get the job done. Good for ya, CX! You da man! And to think people whine about how much bike maintenance/repair costs. CX, hit us with the funny stuff too - you know, the ones the customers bring in and you have do your best to keep a poker face as you explain the errs of their ways. 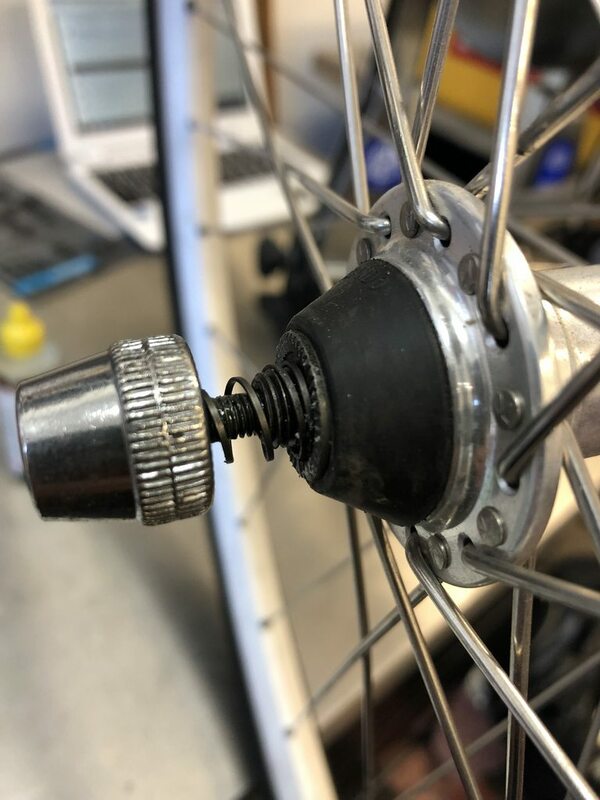 Example: A friend brought a kid's bike to my house that was "... just unridable - the brakes, gears, nothing works right" I looked at the bike... rotated the handlebar 360 degrees and said "There ya go." How are you going to ride w/o ruining every piece of clothing you have on? All the extra wasted lube coats everything that doesn't need lubrication and makes sure that every last bit of dirt and grit sticks to it making a pretty effective grinding paste. This will accelerate wear on your chain, cogs, and chainrings...not make them last longer. Bringing a bike in for a tune up like this is akin to wolfing down a nice combo pizza directly before showing up for your cleaning appt at the dentist. 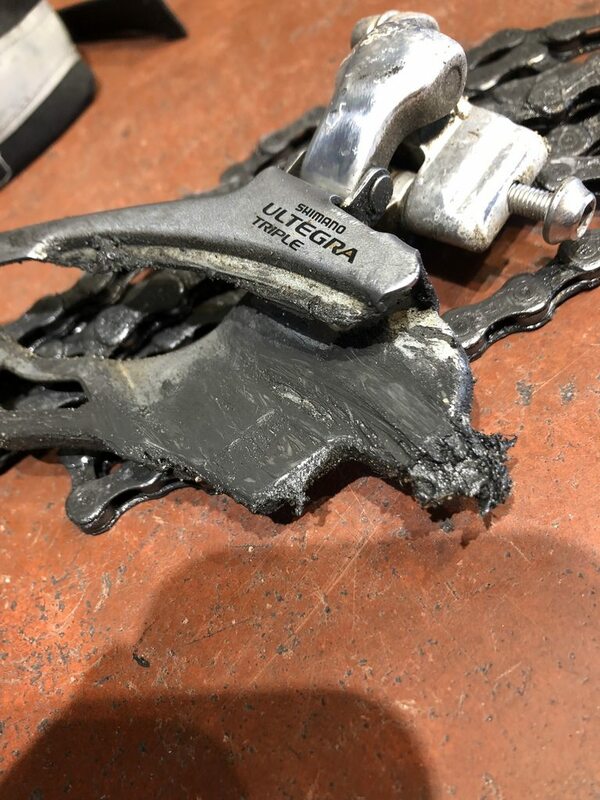 If you're going to take the time to lubricate your chain please make an effort to avoid an environmental disaster, your mechanic (and whoever does your laundry) will appreciate it. That one looks more like eating a box of Oreos on the way to the dentist. That one is a classic! Guy called yesterday about doing the 'break-in' tune up on his kid's bike. 16" w/ coaster brake. Rule of thumb if you have to take a shower after putting a dropped chain back on you probably need to dial back the lube and up the routine cleaning. Hey, post some pics of all the clueless ways people tighten down their quick-releases! Who posted my Ultegra RD online? The crowd that applies the "more is better" thought to doing things. Has this been seen on any Campy Record or Dura Ace equipped bikes? How can I avoid being this guy? Generally, what I do when lubin' my chain is this: Spin the cranks backwards and apply degreaser...let the chain do a few revolutions, then get my rag and sorta pinch it around the chain to soak up whatever degreaser I used, as well as the old lube. Again, spinning the cranks backwards, I apply a small stream of oil to the chain (at the cassette) and let it go for one revolution, using the master link as a reference, then stop using the oil. I'll flip it around and spin the cranks so that they're driving the wheel for a few rotations, shifting up and down a few times, to get the oil everywhere it needs to be, then go back to spinning it backwards with a rag to finally get all the excess off. Is that the proper thing to do? No, and no. 1 drop per roller, no 'stream'. For whatever reason I do this on the bottom run of chain, not on the cassette. You chain should look pretty much clean ALL the time. I'm not super picky about chain lube as long as you can clean it easily. I hate wax. I cannot recommend Pedro's degreaser enough, the thickish amber colored stuff. I hate aerosol spray degreasers, they have too many solvents and dry off way to quickly. The Pedro's can be brushed on and it stays on the chain and cogs doing it's thing til you wash it off. I used a big car washing sponge and lots of suds to clean the chain after degreasing. Rinse w/ water, dry it, lube it...done. At my first wrenching job in the mid 90s, I noticed where a co-worker had installed some Gore Ride-On cables. He had cut the liner so it was only on the exposed cables between the cable stops. As I recall we actually had some extra liners to salvage that job. WTF!!! 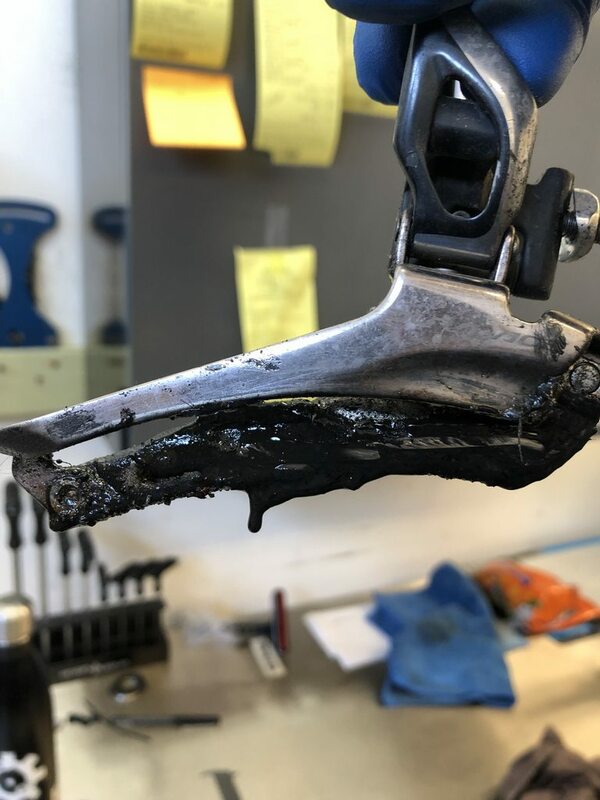 I almost spewed coffee on my computer screen when I saw that middle pic of the dripping derailleur! My guess is that the customer took a spray can of his favorite penetrating oil and doused the chain in it. YIKES! 1 drop per roller, no 'stream'. For whatever reason I do this on the bottom run of chain, not on the cassette. This is the way I do it. One drop per roller. Then wipe the outside clean as I run the pedals backwards. Clean when I start ride after lubing, it's always kinda gunky after the first ride. So I wipe the chain again with a WD-40 soaked rag (Mike T.'s method), then give it another clean dry rag wipe. Now it's good until the next lube - 500 miles or until caught in the rain, whichever comes first. 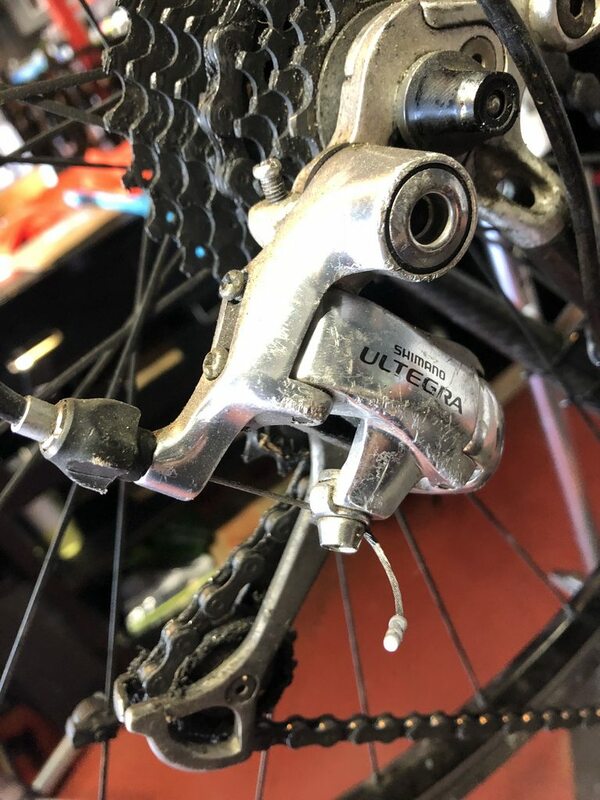 I apply a small stream of oil to the chain (at the cassette) and let it go for one revolution, using the master link as a reference, then stop using the oil. That just wastes lube. (You don't need lube on the cassette) Makes a mess. And increases the probability that you're going to drip oil onto your rim (or disc brake) causing brake squeal and ineffective braking. No, and no. 1 drop per roller, no 'stream'. For whatever reason I do this on the bottom run of chain, not on the cassette. 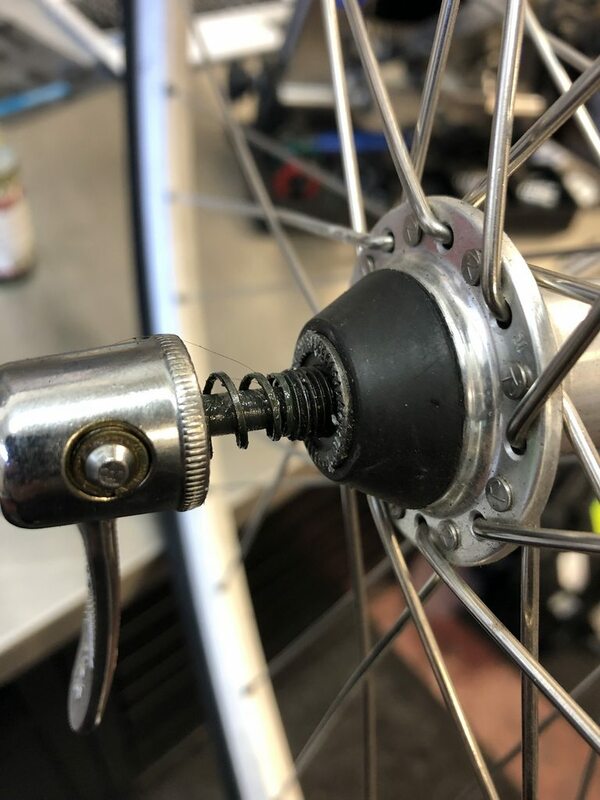 Doing it on the bottom of the run gives the lube a few seconds to wick into the roller before getting wiped onto the chain rings. And if you apply too much it's not going to drip on your wheels. I don't use a drop, nor do I use a stream. I use a partial drop per roller. Basically I open the bottle until it will drip but not run out, then put the tip on the bottom run of chain and backpedal. The chain will take oil that way, but less than a drop per link. Then wipe. Admittedly, that takes some practice to make it apply enough but not too much. I do a final step too. When all done and wiped, I pedal the bike with good force on the stand. If it is a parking lot lube (rain during transport, for example), I ride around the parking lot. That forces much of any excess out, for a final wipe. I usually give a quick wipe after the first ride as well, per Lombard. That gets the very last of any excess off. This has done me well, even for MTB in dry, western USA conditions.